The Hope Project was a three phase nationwide multimedia project aimed at opening up a conversation with people about hope. The initiative was triggered by the 200th anniversary in 2014 of the first invited Pakeha settlement and gospel preaching in Aotearoa-New Zealand. Over three years 650 NZ churches partnered … thousands of Christians were encouraged and equipped to have conversations with those outside of church … and 1.4million homes were reached through a multiple media effort with the Christian message – three times! Read the End of Project Report & be encouraged by all that has been achieved! To initiate a conversation about the reasons for the hope we have in Christ (1 Peter 3:15) with every home in New Zealand, while preparing followers of Jesus to gently engage those conversations. Regarding the media project, authenticity, gentleness, humility and respect are high values. Regarding our churches, a clarity of understanding regarding the mission of the church, as well as a commitment to a healthy and balanced focus on it, are important values. Phase I launched in October 2014 with two weeks of TV ads, a nationwide drop of ‘The Invitation’ booklet, and the launch of the Hope Project and 10 Day Challenge website – all supported by over 300 partnering churches. 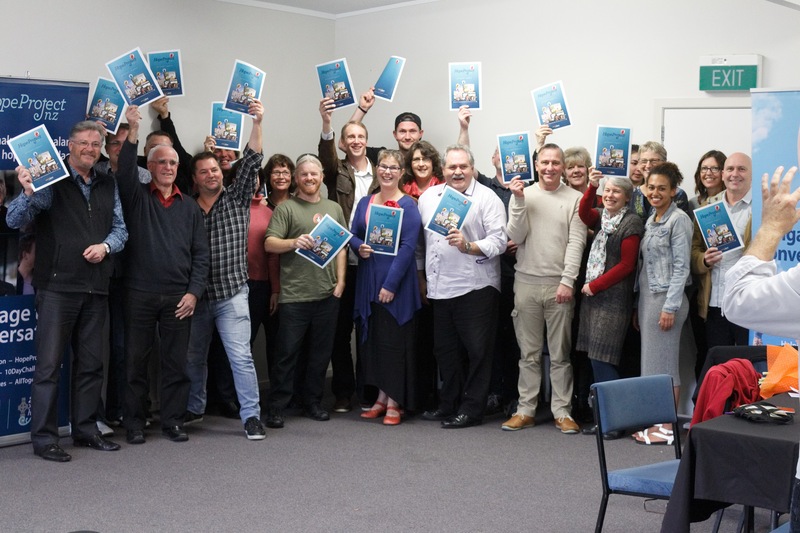 Phase II launched in May 2015 with 400+ NZ churches in partnership. 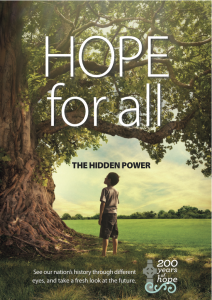 It included a nationwide drop of ‘The Hidden Power’ booklet, TV ads, and the launch of Hope Project FB and the Cornerstone discipleship series. Phase III launched on 6 March 2016. 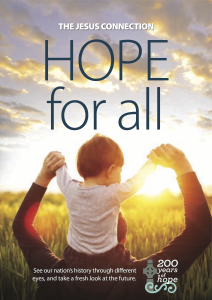 With the support of almost 700 churches it included new web media, a nationwide drop of ‘The Jesus Connection’ booklet and three weeks of TV ads encouraging people to attend church. 2014 marked th e bicentenary of the arrival of Christianity in New Zealand, at the invitation of Ngapuhi Rangatira, Ruatara. He invited his friend, the Rev Samuel Marsden, to start a settlement in New Zealand next to his Pa (named Rangihoua) in what is known of today as Oihi Bay near Kerikeri. The first Christian message was preached on Christmas day 1814 to a crowd of 300 or more Maori, with three families (the Kings, Kendalls and Halls) then staying on to begin the work with Maori, supported by Ruatara’s people. The NZ Missionary story is largely unknown, and is far more positive than most could imagine. 2014 was viewed as a fitting time to begin this project for this reason. Eight questions in eight minutes about the Hope Project with Dave Mann – project coordinator. The goal was much bigger than having more people in our churches. Some sceptics found reasons to become seekers. Some seekers found reason to become believers. Some believers found reason to become witnesses. Initial media impact: While some were impacted by the booklets, others were impacted by the tv ads, others by web media, and others by their conversation with Christians. Wider impact: Ideas remain in conversation for months. Booklets remain in many houses for years. And impressions remain in thoughts decades! The first two phases of the Hope Project were very well received. More than 2 million NZers connected with the TV ads in each phase. More than 1.4 million homes connected with each of the three booklet. Well more than 50,000 ‘no circulars’ homes had booklets personally delivered to someone at the door with each media effort. More than 130,000 people engaged with web media, with social media in addition, which was amped up in the second phase. More than 160,000 spare booklets were sent out upon request in each phase of the project, and well more than 50,000 church people were prepared by their pastors to engage the conversations – including more than 650 churches who formally partnered, coming from all Christian denominations. To the right are snippets of amazing feedback we received. The five year, three phase Hope Project has now concluded — and we celebrate over all that God has done in Aotearoa through this united effort. 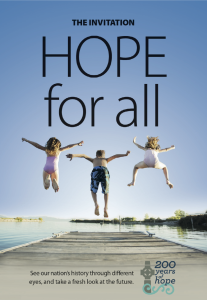 Open the End of Project Report, or read 10 top-line achievements of the Hope Project. We are now looking forward with a new vision — see the vision video here. — Rev Phil Woodmass, South Taranaki.